Oleg Evgenyevich Menshikov PAR (Russian: Оле́г Евге́ньевич Ме́ньшиков; born 8 November 1960) is a Russian entertainer. He is a film and theatre actor, singer and director. He started his film career in the early 1980s playing in the comedy Pokrovskie vorota and in Nikita Mikhalkov's Rodnya. In 1993, Menshikov collaborated again with Mikhalkov in their most famous film, Burnt by the Sun. 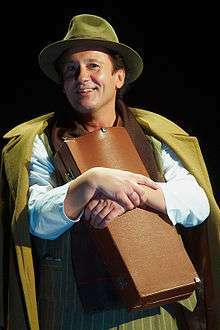 Portraying a manipulative and suicidal NKVD agent during Joseph Stalin's Great Purge, Menshikov's performance brought him to the attention of a wide international audience. The film won the Grand Prize at the Cannes Film Festival and the Academy Award for Best Foreign Language Film. 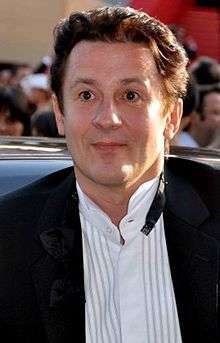 In 1997 he was the President of the Jury at the 20th Moscow International Film Festival. Menshikov appeared in Régis Wargnier's 1999 film, East-West with Sandrine Bonnaire and Catherine Deneuve. Menshikov played the hero of Mikhalkov's 1998 The Barber of Siberia, with Julia Ormond playing his lover. He appeared as Erast Fandorin in the 2005 film The Councillor of State. He filled the role of Ostap Bender in the 2006 Russian mini-series based on The Little Golden Calf. ↑ "20th Moscow International Film Festival (1997)". MIFF. Retrieved 2013-03-22.